Justin and Sarah met while taking a class together at college. They were grouped together for a project, and though Justin was the "class clown," Sarah was impressed by his charisma and charm. However, fate didn't bring the two together until after college. Justin and Sarah had both been working for different ministry programs, and Justin dedicated to ask Sarah about churches in the Lynchburg area. She invited him to church, and their journey together began. On the day of Justin's proposal, he was one day away from flying back to Finland for work. He told Sarah he wanted to do something different for his last day in the states, so they went out to a surprise lunch together. Sarah was exhausted and slept throughout the entire car ride, so it was truly was a surprise when she woke up at Mama Maria's Italian Restaurant in Salem. After lunch, Justin drove Sarah to Lake Spring Park. Sarah had always dreamed about getting engaged on one of her favorite bridges in Central Park, so Justin picked out a similar bridge to take Sarah to. As she was taking in the scenery, he got down on one knee and asked her to be his wife. Naturally, Sarah said yes, but the surprises didn't end there. Justin had gotten her parents to travel down from New Jersey to secretly snap some shots of the proposal. Sarah was floored, but Justin had one more trick up his sleeve: The newly engaged couple drove to the Salem Red Sox baseball stadium where Justin's entire family, a bunch of Sarah's coworkers and friends, and other loved ones were waiting for them. It was an absolutely perfect night. 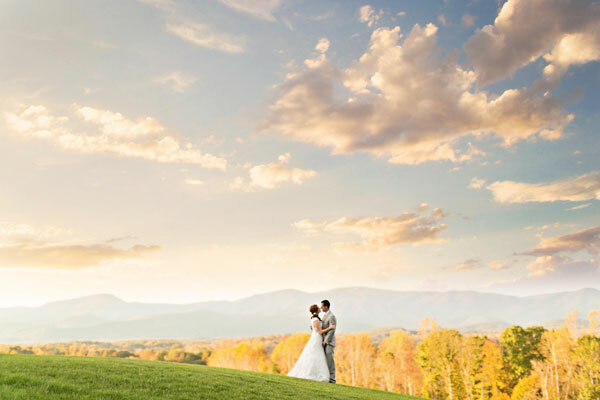 Justin and Sarah got married in a beautiful pine grove overlooking the Blue Ridge Mountains. The fall colors were tremendous, and so the couple decided to incorporate a little bit of natural simplicity into their wedding. For favors, they had a trail mix bar and Sprecher Soda, an old-timey soda brand that Justin grew up with in Milwaukee. 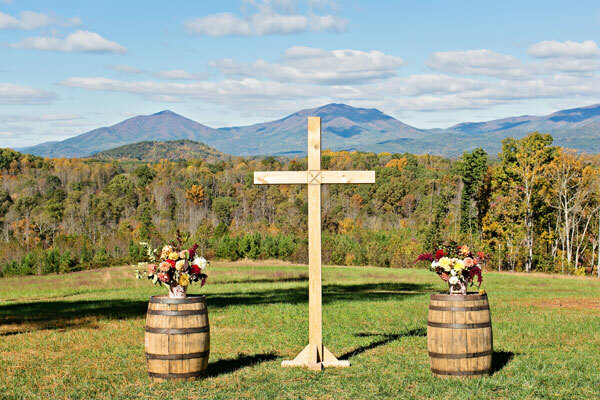 Their venue, Sierra Vista, needed few decorations to stand out amidst the lovely scenery, so Sarah and Justin kept it minimalist, placing a few barrels and flowers here and there and letting the large wooden cross at the end of the isle serve as a centerpiece. 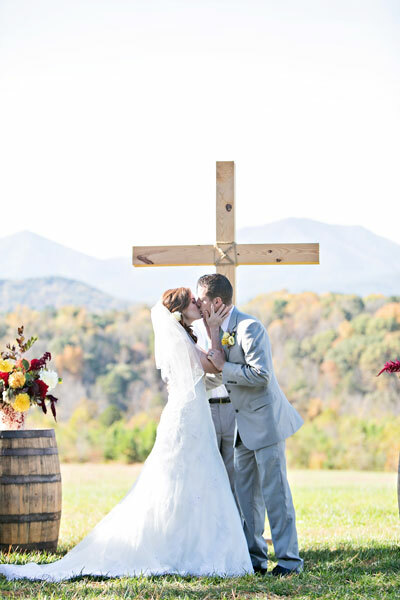 The barn at Sierra Vista added a rustic country feel to the colorful fall celebration. Again, Justin and Sarah used natural decorations: wood, burlap, twine, and glass. Autumn-colored florals, wildflowers, and greenery were prevalent throughout the space, and the couple's guest book was the ultimate nod to nature. Rather than have a plain book for guests to write in, Justin and Sarah had a makeshift tree where guests left fingerprints to represent leaves. 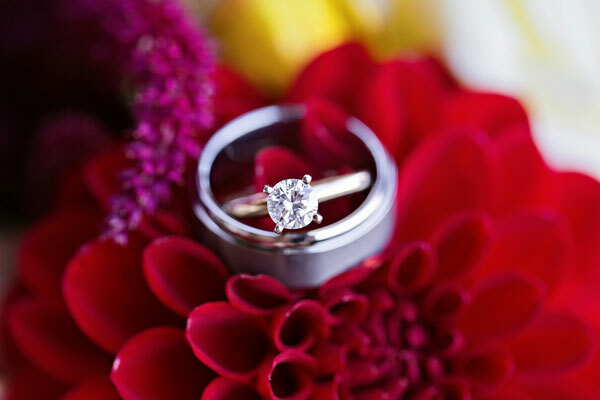 Sarah's top priority when planning the wedding was having a celebration that was both comfortable and enjoyable. The atmosphere was very relaxed, and the focus was on fun. The reception included a "kids only" section where children could play games and make arts and crafts. For the adults, corn hole, a ring toss, and various puzzles were set up across the grounds. The small, intimate guest list allowed all guests to interact and feel comfortable with each other, and the laid-back atmosphere was echoed by the wedding playlist. Though the couple shared a memorable first dance to a slow and sweet love song, they also included remixes of "Turn Down for What" and other upbeat pop songs. The wedding was a perfect representation of Sarah and Justin's unique personalities, their devotion to each other, and their love for God. Be sure to see the Fredrich wedding on page 108 of the third issue of bridebook!